Jackson Lanzing and Collin Kelly will write the series, with a rotating cast of artists. DC Collectibles’ Gotham City Garage line, which features the company’s heroines as bikers, is getting its own digital comic series. The comic will feature leathered up, helmet-wearing (safety first!) verisons of Harley Quinn, Wonder Woman, Catwoman, Lex Luthor and more. Jackson Lanzing and Collin Kelly will team up to write the series, which will have rotating artists. Supergirl artist Brian Ching and DC Talent Development Workshop student Lynne Yoshii are up first. It’s been a decade since Governor Lex Luthor saved his people from devastation and turned Gotham City into the modern utopia known as The Garden. With the rest of the world in ruins, Luthor’s city continues to thrive—but not for everyone. Order has been kept only by the LEXES technology that networks the entire population under one mindset—and if a citizen steps out of line, the Bat and his minions are brutal in restoring the status quo. 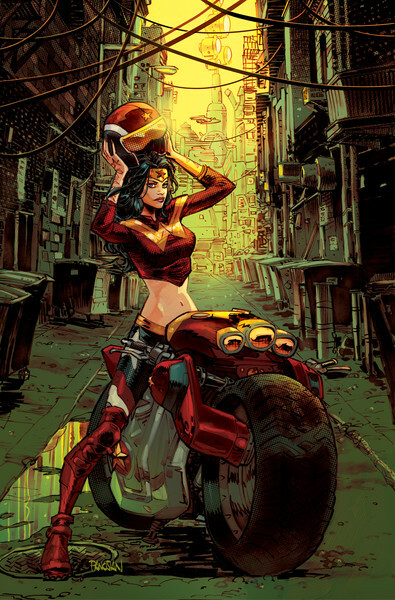 So when a young Kara Gordon comes under suspicion by her LEXES superiors, she heads straight into the dreaded wasteland—where she’ll discover the fierce oil-and-gear rebels of the Gotham City Garage. The series debuts digitally Aug. 16, with a new chapter released biweekly through October 2017 and weekly thereafter. Print issues collecting the story will begin in October. Rafael Albuquerque will provide the first issue’s cover, while Dan Panosian will provide the variant (seen below).